Arsenal will face Everton in next month's FA Women's Cup final after both sides won thrilling semis. The Gunners beat Chelsea 5-3 after extra-time, England striker Kelly Smith scoring twice having missing a penalty. The final, at Milton Keynes on 1 June, will be a repeat of the 2010 final in which the Toffees beat the Gunners 3-2. Arsenal's win avenged their 2012 semi-final defeat by Chelsea. Neither goalkeeper came under severe pressure until the Gunners were awarded a 37th-minute penalty for a foul on striker Freda Ayisi, but Smith's spot-kick was saved by goalkeeper Marie Hourihan. The second half was far more open as both sides went for goals. Chelsea's South Korean striker Ji So-yun converted an Eni Aluko cross to open the scoring in the 69th minute. Arsenal have won the FA Women's Cup a record 12 times, with Southampton (eight) their nearest rivals. Smith equalised within a minute, heading in from striker Danielle Carter's cross. Japanese striker Yuki Ogimi put the Blues back in front in the 85th minute when she forced the ball home after a block by keeper Siobhan Chamberlain. But again Smith, this time with a superbly curled 25-yard shot, levelled the scores inside 60 seconds. The Gunners took the lead for the first time as Carter tucked a close-range shot into the net three minutes into extra-time. And six minutes later they went further ahead when Japanese striker Shinobu Ohno headed in a Carter cross. Striker Aluko brought the Blues back into contention in the 104th minute, racing through to beat Chamberlain from 18 yards. But central defender Casey Stoney wrapped up Arsenal's victory with a header from left winger Rachel Yankey's 109th-minute corner. Having gained FA Cup revenge on Chelsea, 12-times winners Arsenal now have the chance to pay back Everton for handing them their only defeat in a final. County winger Dunia Susi went close with an early effort, but Parris put Everton in front with a fine 14th-minute header. Central defender Rachel Corsie sent a 24th-minute free-kick inches wide as County hit back. But five minutes later Parris doubled her tally, turning the ball over the line after goalkeeper Carly Telford had spilled a Danielle Turner cross. Telford partly amended for her mistake with a brave save at the feet of Parris seven minutes before half-time. The Magpies fought back after the interval and Hoyle shot home in the 55th minute after fellow midfielder Katie Holtham's headed pass. 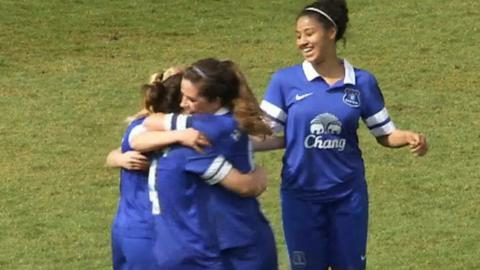 Striker Jess Clarke was unlucky on the hour-mark with a 25-yard drive that hit the Everton post. Notts County pressed for much of the final half hour but could not force an equaliser. Everton's victory took them into the final for the fourth time, the first of their two wins coming in 1989.